This reading group guide for Little Broken Things includes an introduction, discussion questions, and ideas for enhancing your book club. The suggested questions are intended to help your reading group ﬁnd new and interesting angles and topics for your discussion. We hope that these ideas will enrich your conversation and increase your enjoyment of the book. From author Nicole Baart, whose writing has been called “gorgeously composed” (Publishers Weekly), “taut and engrossing” (Booklist), and “evocative and beautiful” (RT Book Reviews), Little Broken Things is an absorbing and suspenseful story about two estranged sisters reunited by the unexpected arrival of an endangered young girl. 1. Little Broken Things explores motherhood in all its many forms. Tiﬀany and Liz are oﬃcial parents, but Nora and Quinn also take on mothering roles in the book. What makes a good mother? Would you consider these women good mothers? 2. Liz is unlike the other characters in the novel. She’s old-fashioned, patriarchal, and even a little racist. How does she change throughout the book? What do you think prompts this change? 3. In the novel, Nora sacriﬁces a great deal for Tiﬀany and Everlee. Why do you think she does that? Would you have done the same in her position? 4. Remembering her late husband, Liz says: “Jack Sanford had not been a good man. True, he was steady and levelheaded and hardworking. He had made a way for himself in a world that favored the lucky, the people who were born with privilege and a place at the table. Jack Sr. had none of those things. But he took a small farmer’s inheritance and made something of it, built a legacy for his wife and kids and fought for it every day of his life. If he argued the validity of a bootstraps philosophy, it was only because he pulled himself up by them. A success story.” Do you feel that Jack’s challenges and determination in any way justify his actions? 5. Tiﬀany’s story is one of heartbreak and loss. She leaves because she believes her daughter will be better oﬀ without her. Is this act sacriﬁcial or selﬁsh? Do you agree with her decision? 6. Nora thinks of her sister as “perfect little Quinn.” In what ways does Quinn live up to that reputation? In what ways does she defy her sister’s expectations? 7. Why do you think Tiﬀany named her daughter Everlee? 8. Although Liz is loath to admit that she and Walker have some- thing in common, they are indeed both artists. Throughout the novel, what are some ways these two characters’ art inﬂuences their worldviews? 9. Who is your favorite character in Little Broken Things? Why? Is there a character you don’t like or don’t understand? Explain. 10. Why do you think Liz’s relationship with her daughters is so strained, and who—if anyone—is to blame? Do you have hope for them at the end of the book? 11. Throughout the novel, Everlee’s paternity is in question. How does the revelation of her real father aﬀect your reading of the novel? Does it change your perspective of certain characters? 12. Toward the end of the novel, Liz tells Macy: “I think I have a God complex.” Do you agree that this aﬄiction could apply to a multiple characters in Little Broken Things? If so, which ones? 13. At the end of the novel, Tiﬀany makes a very deliberate decision that ends in Donovan’s death. Is she a killer? 14. Walker names his sculpture Elizabeth Undone. Why do you think he does this? Is that an appropriate title for his piece? 1. Art plays an important role in Little Broken Things. Visit an art gallery with your book club, or if there is not one nearby, encourage book club members to share a picture of their favorite pieces of art. 2. Motherhood is a major theme in the novel, and many of us often forget how much sacriﬁce and love it requires. Take a moment today to thank your mother for the role she plays in your life. Send a card or ﬂowers, or simply pick up the telephone. If your mother is no longer living, share a treasured memory of her with a friend or family member. 3. The Sanfords were known for their fabulous parties. Throw a party for your next book club meeting. Dress up, drink champagne, and enjoy some of the appetizers mentioned throughout Little Broken Things (e.g. endive stuﬀed with goat cheese and blood oranges; prosciutto-wrapped ﬁgs; or cherry tomato, mozzarella, and fresh basil skewers). 4. Like Everlee, many children from broken homes ﬁnd themselves in diﬃcult situations and could use a little kindness and help. Make a donation of clothing, toys, or money to your state foster care organization or bring grocery items to your local food pantry. You never know the impact your gift may have on a child and his or her family! "Sweet, scary and sometimes sordid, Little Broken Things is filled with determined women tenacious in their love for a girl whose childhood has been anything but easy." "Mesmerizing...an accomplished exploration of the fragile bonds of a family as they attempt to overcome obstacles they never saw coming. "Baart’s novel of familial ties, betrayals, and longoverdue confrontations ventures into the territory of Paula Hawkins, Mary Kubica, and Kimberly Belle. Baart’s pacing keeps the novel driving forward, while a core group of narrators offers different perspectives on the murky facts of Lucy’s upbringing. Full of twists and turns, this is a great addition to the recent surge in suspenseful domestic fiction." "Part psychological thriller, part women’s fiction, Baart’s latest novel is wholly compelling. Told from the perspectives of three complex women (a mother and her two adult daughters) over the course of four emotional days...Questions abound and, in true thriller fashion, answers are doled out on a need-to-know basis, keeping the tension high from beginning to end. Baart’s smartly exquisite prose and her setting of a scene, not so much physically as mentally, allows readers to relate personally to these three women and to embrace the little girl in their care. The intricacies of family relationships, love and friendship are all skillfully explored, layered in all the right places and captivating in its entirety." "Richly atmospheric and featuring a compelling cast of sharply drawn female characters, Little Broken Things is both a page-turner and a thoughtful examination of what it means to mother and be mothered, in all its most real and varied forms." "Beautifully layered...gives readers everything they could possible want in a novel - vivid, engaging characters, a town filled with dark secrets, a mind-twisting mystery and the ferocious power of a mother's love. Original and gripping, Little Broken Things is a stunner that will linger with you long after the final page is turned." "Nicole Baart weaves exquisite writing with unstoppable drama in this tale of family schisms and secrets on a collision course with life-threatening danger. Putting down Little Broken Things was impossible." 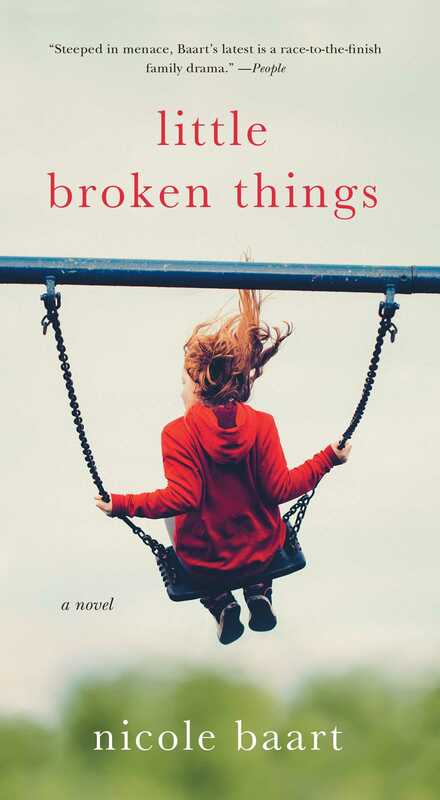 "I have long been a fan of Nicole Baart’s finely crafted, flawed characters, her deft plotting, her fluid, lovely writing, and all of these gifts are on display in Little Broken Things. I cared about these sisters, feared and hoped for them, and lost my heart to Lucy, the locked-shut little girl living in the center of the book’s secrets. It’s a gripping and suspenseful tale that kept me turning pages late into the night; move it to the top of your stack." "Nicole Baart has outdone herself with this lush, evocative family drama full of shocking twists and a heart-warming grand finale. I will think about the Sanford family for a good long time. Put Little Broken Things on your fall reading list now!" "Little Broken Things made me abandon my life and responsibilities for days. Stunning, beautifully wrought, tenaciously hopeful—move this book to the very top of your book club list."